This page is in serious need of updating, which I hope to complete during 2017. Colitis means inflammation of the colon. The colon (also known as the large intestine) is part of the digestive system. Stool is stored here, and the colon also digests unabsorbed nutrients. An acute attack of colitis may be caused by stress or poor diet. Chronic colitis may be caused by a virus or by parasites; it may also be associated with IBD. Food allergies may also cause colitis. The most common symptom of colitis is diarrhoea, often with bright red blood present. The cat may need to rush to the litter tray (and may sometimes get caught short), and the stool may be slimy. Colitis may be acute or chronic, but even the chronic version (which Harpsie had) is not normally associated with weight loss. Your vet will probably want to test your cat for FIV and FeLV (feline leukaemia). A faecal (stool) sample will also be obtained, both to check for parasites and bacteria. If the treatments below do not help, or only help for a short time, your vet may also wish to perform a biopsy. An antibiotic called metronidazole (Flagyl) is both anti-inflammatory and can kill parasites such as giardia. It tastes utterly foul, so if your vet prescribes this, try to give it in a gelcap. Fructooligosaccharides (FOS) are complex carbohydrates which are fermented by bacteria in the colon. They promote the growth of "good" bacteria in the colon and inhibit the growth of "bad" bacteria. Short-chain fructooligosaccharides, in spite of being fermented in the upper part of the large intestine, have anti-inflammatory activity in the TNBS model of colitis (2006) Lara-Villoslada F, de Haro O, Camuesco D, Comalada M, Velasco J, Zarzuelo A, Xaus J, Galvez J. European Journal of Nutrition July 2006 Epub discusses this further. Fibre can help with both diarrhoea and constipation, so adding fibre such as psyllium to the diet may help some cats with colitis. If your vet suspects the colitis is caused by food allergies (which was probably the case with Harpsie, though we did not realise that at the time), you may wish to try an elimination diet. The Food Allergies page has more information about this. Occasionally the vet will recommend steroids. There is more information about steroids in the IBD section. Mar Vista Vet has a detailed overview of colitis. The Merck Veterinary Manual has information about colitis. The Pet Center discusses colitis and IBD. Feline Advisory Bureau has information about colitis. Inflammatory Bowel Disease or IBD occurs when cells involved in the body's immune response (such as eosinophils) attack the lining of the gastro-intestinal tract, causing a thickening of the lining. If this happens in the colon, it results in colitis. However, colitis is not always caused by IBD. Deborah, human of Frankie, a Siamese cat (left), set up a programme at Colorado State University College of Veterinary Medicine. You can make a donation here. In some cases IBD is caused by an allergen, but in many cases the cause is unknown. Often vets do not delve too deeply into the cause since it is so hard to determine. These may vary depending upon which part of the gastro-intestinal tract is affected. If the colon is affected, you will see diarrhoea with fresh blood (colitis). If the stomach is affected, vomiting will occur. Problems in the lower small intestine will cause watery diarrhoea and weight loss. Some cats will have problems in all these areas. Of course, all cats have vomiting or diarrhoea occasionally, but with IBD the problem will be chronic, although sometimes you will only see problems intermittently. Blood tests will be run but will often be normal, although Harpsie's ALT (a liver enzyme) was mildly elevated for years, and his vet told me this often happens in cases of IBD because blood flows to the liver from the gastro-intestinal tract. In severe cases total protein (TP) levels in the blood may be low because albumin (a component of total protein) may leak into the bowel due to the inflammation. Harpsie's vet also performed an abdominal ultrasound and he saw thickening in Harpsie's intestines which he said was consistent with a diagnosis of IBD. In more than 50% of cats with IBD, this thickening can also be felt by the vet. However, the only way to confirm the disease definitively is via a biopsy (taking tissue samples which will be analysed for signs of inflammation). Biopsies may be performed surgically or endoscopically ("keyhole" surgery); but since surgical biopsies are invasive and either method requires anaesthesia, many vets opt to treat as if the cat has IBD, and if the cat improves, they assume their suspicions were correct. If your vet suspects the IBD is related to food allergies (which was probably the case with Harpsie), you may wish to try an elimination diet. The Food Allergies page has more information about this. Some people have found that feeding a raw food diet to their IBD cat is helpful. If you go this route, you need help creating a suitable diet because cats have particularly complex nutritional requirements. Role of diet in the health of the feline intestinal tract and in Inflammatory Bowel Disease is a very interesting report by the Winn Feline Foundation. The vet may also prescribe an anti-inflammatory medication such as metronidazole (Flagyl). It tastes utterly foul, so if your vet prescribes this, try to give it in a gelcap. Adding fibre such as psyllium to the diet may help some cats with IBD. Often corticosteroids are prescribed in order to reduce the inflammation that is present. One commonly used steroid is pred (prednisone or prednisolone). Cats metabolise prednisolone better than prednisone (they have to convert prednisone into prednisolone in their bodies anyway before they can use it) so it is usually better to give prednisolone in the first place. Vet Contact reports on a study entitled Bioavailability and activity of prednisone and prednisolone in the feline patient (2004) Graham-Mize CA & Rosser EJ Veterinary Dermatology 15 (s1), pp 10 which supports this view. Your vet may wish to start at a higher dose to reduce the inflammation, then reduce to a maintenance dose. If a cat is prescribed steroids, they should not be stopped suddenly, but rather the dose must be tapered. This is because using corticosteroids may suppress the adrenal glands' ability to produce cortisone naturally; so tapering the dose minimises the risk of adrenal insufficiency occurring as a result. Unfortunately cortico-steroids can have serious side effects with long-term use (including triggering diabetes, fluid retention and resulting hypertension, and masking infections). Corticosteroids cannot normally be used in diabetic cats. Another potential problem when using them for suspected IBD without having a definitive diagnosis is that your cat may actually have a form of cancer called lymphoma rather than IBD; and using corticosteroids can make it much harder to diagnose lymphoma later on. If your cat develops congestive heart failure (CHF) within a week of starting corticosteroids, the steroids may be the cause. One study, Corticosteroid-associated congestive heart failure in 12 cats (2004) Smith SA, Tobias AH, Fine DM, Jacob KA, Ployngam T The International Journal of Applied Research in Veterinary Medicine 2 (3) pp159-170 found that some cats developed a unique form of congestive heart failure within seven days of starting steroids. Five of the cats died, but the seven that survived did much better than the typical CHF patient once taken off the steroids. Newman Veterinary has helpful information about steroids. Veterinary Partner discusses pred and explains how corticosteroids work. Mar Vista Vet discusses the potential problems of ongoing steroid use. Glutathione is an amino acid, which has anti-inflammatory effects in the gastro-intestinal tract. It is possible that those with IBD do not produce sufficient glutathione, and that this is a factor in the development of IBD. Cats tend not to produce much glutathione. Impairment of intestinal glutathione synthesis in patients with inflammatory bowel disease (1998) B Sido, V Hack, A Hochlehnert, H Lipps, C Herfarth, W Dröge Gut 42 pp485-492 suggests that supplementation of glutathione might be helpful for IBD sufferers. Replenishment of glutathione levels improves mucosal function in experimental acute colitis (2000) Ardite E, Sans M, Panes J, Romero FJ, Pique JM, Fernandez-Checa JC Laboratory Investigation 80(5) pp735-44 indicates that NAC may help with IBD. However, The effect of dietary glutathione and coenzyme Q10 on the prevention and treatment of inflammatory bowel disease in mice (2004) Liu C, Russell RM, Smith DE, Bronson RT, Milbury PE, Furukawa S, Wang XD, Blumberg JB International Journal for Vitamin and Nutrition Research 74(1) pp74-85 found that whilst glutathione and CoQ10 appeared to help with symptoms during acute attacks of IBD, the mice in the study also had more ulceration afterwards. It appears that there may be a link between IBD and the development of cancer later on. This is probably what happened to Harpsie. Winn Feline Foundation discusses this possible link. Inflammatory bowel disease and intestinal lymphoma in cats (2001) is a presentation by Dr TR Tams to the Atlantic Coast Veterinary Conference. Does inflammation trigger cancer in cats? (2007) Day MJ is a presentation to the World Small Animal Veterinary Association World Congress 2007. Mar Vista Vet has an excellent overview of IBD and how it relates to colitis. 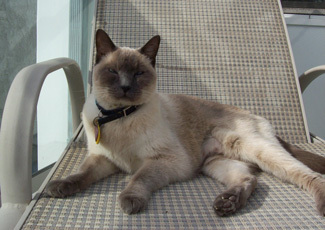 Winn Feline Foundation discusses feline IBD. The Merck Veterinary Manual has a good but rather technical discussion of IBD. Feline Advisory Bureau has information about IBD. Pet Education has helpful information about IBD. Feline IBD List is a support group for people with a cat with IBD. It focuses on raw food diets in particular. When I joined this group, however, nobody actually responded to my enquiry. Harpsie first developed colitis when he was about two or three years old. One morning we were greeted by diarrhoea with bright red blood but otherwise he seemed fine. Of course we took him to the vet, and he was put on antibiotics and it cleared up; but after a couple of weeks, it returned. It was not always diarrhoea, but there was often bright red blood in his stools. We went through this cycle for nine months, using various antibiotics (including metronidazole), until finally the problem seemed to clear up. Although the vet referred to the problem as colitis, I knew no more than that (this was in the mid-90s and I was not online at that time), and had no idea that it might be related to IBD. We also did not realise that the problem might be related to food allergies - we made no changes at all to Harpsie's diet, and at that time he would only eat dry food, which probably contained quite a lot of grain, which we later suspected was one of his allergies. Harpsie appeared to do fine for a few years as regards his colitis, although unbeknownst to us, his ongoing skin and ear problems were most likely also allergy-related, and therefore another form of inflammatory response. His ALT (a liver enzyme) was consistently elevated in all these years - my vet checked his liver and it was fine, so we thought nothing more about it, and just chalked it up as being a Harpsie-ism. It was only years later that our new US vet mentioned that in his experience, consistently elevated ALT was often seen in cats with IBD. In light of Harpsie's by now confirmed food allergies, the vet said he believed Harpsie also had IBD, and that his special limited ingredient prescription food would also be helping the IBD. He suggested that we continue feeding this food, which we did until Harpsie became ill in mid-February 2006. The vet examined Harpsie thoroughly, including via abdominal ultrasound. He saw a thickening in Harpsie's intestines which he said was consistent with a diagnosis of IBD. 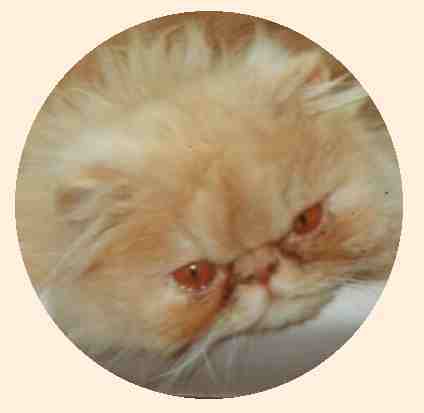 He suspected that Harpsie also had pancreatitis, which is often associated with IBD. In fact, it later turned out that Harpsie did not have pancreatitis, and the changes in the abdomen were probably caused by the cancer which killed Harpsie three months later. But we and the vet still believe that Harpsie had IBD in addition to the colitis, and that he had had this for quite some years. In retrospect, I so wish we had taken Harpsie's experiences with vomiting and bloody diarrhoea more seriously but his problems tended to be intermittent, and we were usually worrying about other more urgent issues (as described elsewhere in this site). I do rather wonder if he might not have left us when he did though, if only we had addressed his inflammatory issues (IBD and food allergies) earlier. Copyright © Harpsie's Site 2005-2008. All rights reserved.